With these updates, Analytics Edge gives you even more control and capability to automate your Excel reports. Both add-ins now provide full access to a user-editable query worksheet. While it is hidden by default, the ᴁ Analytics Edge Queries worksheet can easily be accessed, allowing you to make copies and quick edits to your queries without using the wizards — ideal for setting up a series of similar queries. 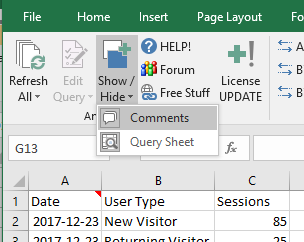 You can even use Excel formulas to ‘calculate’ the values used in your queries, making it easy to reference values on a setup worksheet for any of the query parameters. Also included is a new behavior that preserves formula columns added to the end of a table of results, making it possible to create calculated columns using Excel extensive formula capability. For example, you could calculate a % Change column from individual months. Finally, both add-ins now make it easier to keep cell references in sync as well! Just ‘Show Comments’, and then make the changes to your worksheets. When you are done, click on one of the cells and all of the queries and cell references in those queries will synchronize with the new cell locations! Download your copy of these latest updates now, and see why they make this update a #GameChanger!